Recent tensions between Russia and Belarus seemed to display the Kremlin’s shattering dreams for integration across the countries of the former Soviet Union. The Moscow-led Eurasian Economic Union (EEU), developed as a rival to the European Union, seemed failing short of its goals, with friendly countries drifting away amidst Russia’s alleged weakness. Fumes flared up after statements of Alexander Lukashenko Belarus’ strongman leader, who has been in charge of the nation for over 26 years witnessing major historical shifts in the Kremlin’s foreign policy, launched a fierce diatribe during a 7-hour long conference. He blamed the Kremlin for violating a two decades old bilateral agreement after the FSB established a security zone on the shared border previously free of any regulations. The decision came as a response to Minsk announcing a five-day visa waivers for citizens from 79 countries—including the United States, a gesture deeply disliked by the Kremlin. Lukashenko also accused Russia of blackmail by cutting oil exports to Belarus by half. He further asked to file a criminal case against the head of Rosselkhoznadzor, a Russian federal service for veterinary surveillance, for inflicting damage on Belarus by restring the export of goods. Over the past years, the country had grown into a major illegal supplier of sanctioned goods to Russia. Despite unabashedly emotional and critical, Lukashenko made it clear that Minsk will remain within the EEU. His speech, however, raised rumors of the union with Russia entering a bumpy road. Continuous disputes between the two EEU members might culminate with Minsk drifting away from Moscow’s orbit. Meanwhile, current hurdles seem troubling and unlikely to get resolved any time soon. Rather, they underscore the complex nature of the union that is sweepingly misinterpreted in the West. As the leadership from countries in the EEU comes from the legacy of the Soviet communist party, treating Moscow as the central authority is not unusual. But, with the acquired sovereignty after the Soviet collapse, the elites of the independent nations have grown increasingly reluctant to share power. Most of the EEU nations face acute problems with corruption, bloated bureaucracies and authoritarian leadership. Unlike the West, nations do not lecture each other on human rights and democracy promotion, treating the current situation as the norm. 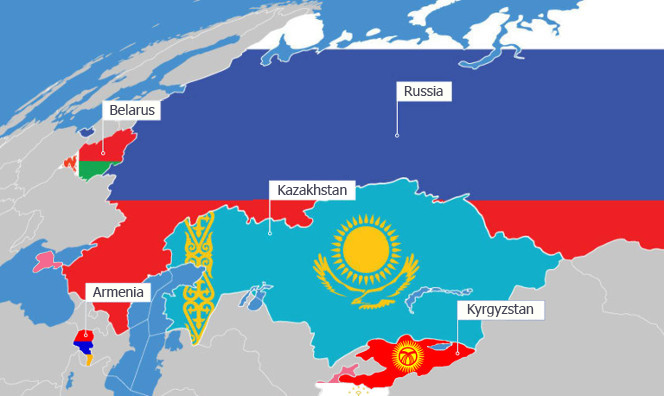 A range of factors from economic dependence to shared cultures and borders make it further impossible for the former Soviet republics to break ties with the Kremlin without shooting themselves in the foot. The Kremlin foresees this and does not want to repeat the radical backlashes against its influence as in the case of Ukraine. Hence, the only format in which the former Soviet space could coexist and benefit economically is one in which the maintenance of international relations is founded on equality. Therefore, the Kremlin tries to stay above political incursions into domestic affairs as long as each country maintain its position within the Moscow-led union. In return, freedom of movement across borders and economic benefits remain among key tenets of the EEU along with a certain degree of political autonomy in foreign policy. Meanwhile, Moscow would be happy to see more support of its actions internationally from the EEU members. In recent years, it has become evident that the economic interests overweight political solidarity—no political support will emerge if it goes against interests of an individual member country. During the Ukrainian crisis, neither Minsk nor Astana expressed support to Russia’s actions and instead maintained neutrality. At some point, both even criticized its actions in Ukraine, concerned with their own sovereignty and security. Similarly, neither legally recognizes statuses of the so-called People’s Republics in eastern Ukraine or South Ossetia and Abkhazia in Georgia. Kazakhstan is the only country that has a stable economy across the EEU. Ruled by the 76-year-old president Nursultan Nazarbayev, its political position balances between pro-Russian, pro-Chinese and even pro-American stances when needed. Regardless of whether Putin and Trump eventually get along, Astana is set to benefit from the new administration with Rex Tillerson as secretary of state possibly championing ties and investments into local oil fields. Kyrgyzstan, another nation of the EEU, has recently launched a more active policy towards China amidst the Kremlin’s inability to fund a promised dam project of Kambarata-1 and the Upper Naryn cascade. The country’s President Atambayev was as harsh as Lukashenko in accusing Moscow over the racist treatment of Kyrgyz migrant workers during the May 9 requiem event for the 71st anniversary of the Soviet victory in World War II. While criticism might pinpoint to the crippling EEU, it rather displays a decentralized partnership encompassing and tolerating internal contradictions, and even democratic forms of interactions among its members. The later comes as a surprise given prevailing authoritarian forms of governance with little tolerance towards dissent domestically. However, it seems that the Kremlin has no choice how to uphold its grip but to maintain such equality in order to keep its Eurasian dream afloat. Dmitriy Frolovskiy is a Moscow-based writer and analyst of Russian politics. His writings have been featured in the New York Times Magazine, Forbes, and elsewhere.